With GraphSynth, one can design, implement, test, and automatically invoke grammar rules that transform a graph from an initial seed into a creative design. Studio .NET, the researchers at UT Austin have developed the tool which is written in C# and which stores rules and graphs in a common XML framework. Here is a link to the old help pages (in the midst of renovating this).
. The following pages describe both theory implementation in GraphSynth. They are laid out in a logical order but one may want to start with Download and Examples. 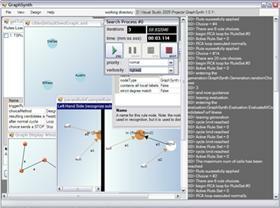 Open-source research software for creating generative grammars developed through a grant from the National Science Foundation (CMMI-0448806).